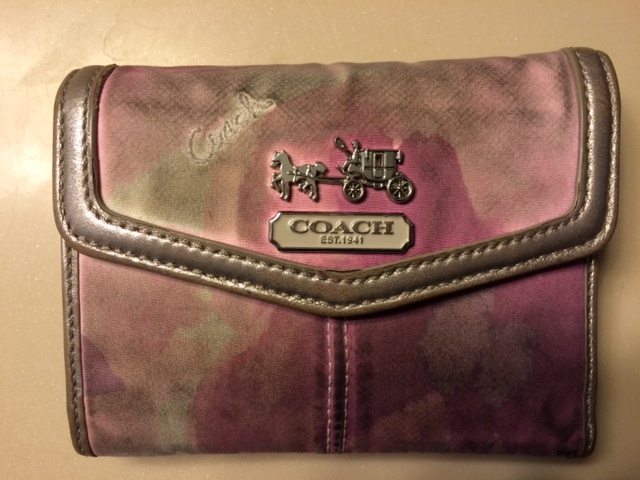 I may be the only woman in America to turned down an offer of a new COACH wallet. 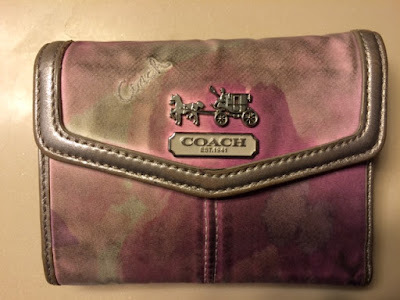 About four years ago my husband bought me an awesome Coach pink fabric wallet to replace an old pleather wallet that was falling apart. I was hesitant to have something so extravagant, but he insisted that I deserved it. Fast forward to a couple of weeks ago. As I pulled out my wallet to pay for groceries I noticed that my wallet was filthy, like grossity-gross-ick-filthy. Even my kids thought it was bad. The "tan lines" visible on my wallet. You can see the upper part was covered by the flap and remained clean. That same night I met a Coach store manager; I told her about my wallet. She insisted it couldn't possibly be as bad as I described. When I pulled out my wallet as evidence she audibly gasped and put her hand to her chest. 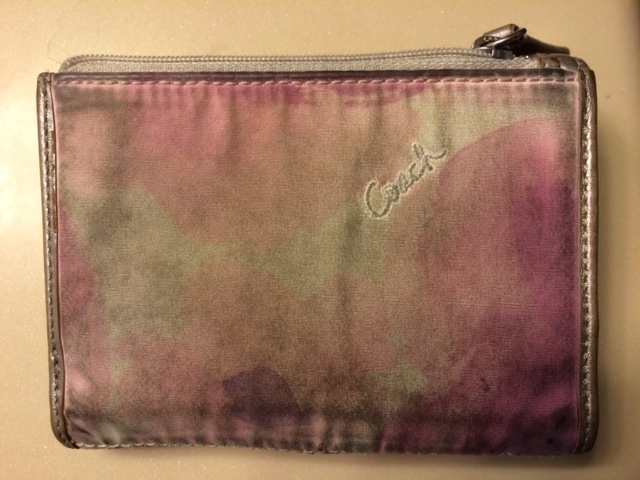 I asked if there was a cleaner for my wallet, she said that Coach carried a fine cleaner, but it may take a few tries to make a difference. 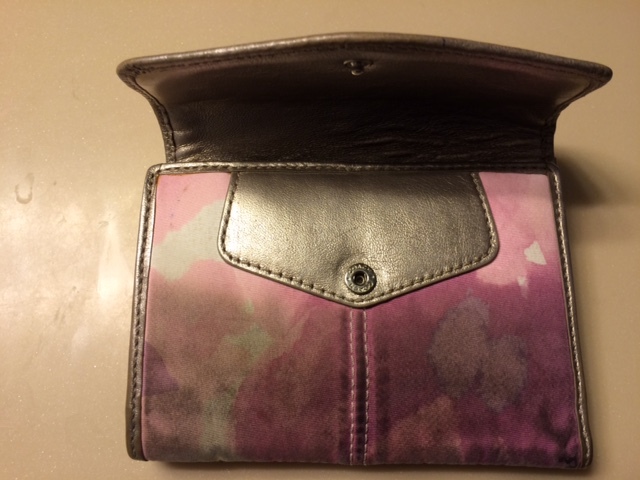 She and a few other women around were in agreement that it was time I had a new wallet. The Coach manager suggested I purchase a leather wallet which was very easy to clean. Once home I showed my husband my dingy wallet, told him of my conversation with the manager, and he agreed I should have a new wallet. Although a new wallet would be nice, I didn't want a new wallet. The frugal-mom in me could not justify spending well over $100 on a new wallet when I didn't even try to clean my beloved pink wallet which was in fine shape. ﻿﻿That night after the kids were in bed I cleared off the bathroom counter, grabbed my wallet, Clean & Clear Essentials Foaming Facial Cleaner, and my exfoliating towel. I held the wallet under running warm water, pumped a few squirts of facial cleaner on the towel and scrubbed away. After a couple of rinses and more scrubbing it looked completely different. 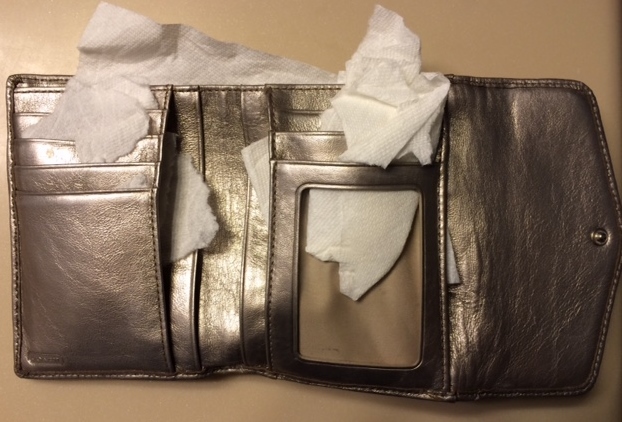 ﻿﻿﻿﻿I wrapped a towel around the wallet to squeeze out as much water as I could, then I tucked bits of paper towels in every slot and left it standing up and open overnight. I didn't clean the inside, but water seeped through. In the morning the wallet looked great again! I searched every nook and cranny and found the only wear was along the silver leather trim on the flap by the metal logo, other than that small area which was hardly noticeable, it was fantastic! The wallet was still a little damp on the inside so I turned on the hairdryer and pointed it in the cash and coin pockets. I must have left it in a little too long because the plastic ID window warped a bit. I was a bit bummed, but now I like it because it warped just enough to allow a perfect spot for my thumb to easily slide out my driver's license. I'm looking forward to another four years with my Coach wallet. Coach products are so well made, it's well worth the purchase price and would make a great Christmas gift!